A Lamborghini Centaro in Transformers: The Last Knight comes out as the highest emissions vehicle at a gas-guzzling 281g per km. Tom Cruise will be seen whizzing around in a BMW M5 Saloon in the forthcoming Mission: Impossible - Fallout. Were he to swap this with a BMW 7 Series 740e he could cut his emissions by a huge 79%. Jeeps are notorious for their high fuel consumption. The Cherokee in 2017’s Logan pumps out 223g of emissions. Switching to a Mitsubishi Outlander would reduce emissions by up to five times. Cars have traditionally played a key role in some of the Silver Screen’s most suspenseful moments, from the Mini Cooper chase scene in The Italian Job, to the action-packed races of Mad Max: Fury Road. 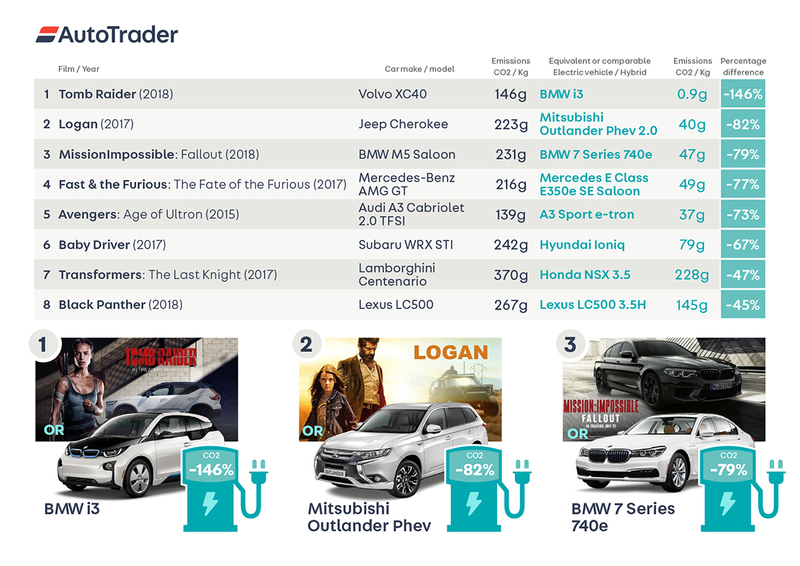 With many countries set to ban production of petrol and diesel cars in the coming years, it’s inevitable that we’ll see an increasing number of electric vehicles represented on the big screen. With blockbuster season upon us, the UK’s largest digital automotive marketplace, Auto Trader, have compiled a ranking of cars that have featured in some of the biggest cinematic releases of the past three years and the green equivalent models the characters could drive instead. Auto Trader’s new electric and hybrid hub features reviews, news and advice from Auto Trader’s experts on choosing the best make and model to meet all needs. This press release was distributed by ResponseSource Press Release Wire on behalf of Re:Signal in the following categories: Men's Interest, Entertainment & Arts, Motoring, for more information visit https://pressreleasewire.responsesource.com/about.